A couple of days ago, Moby promised in a tweet, "Not to exaggerate, but on Thursday we'll be posting the best music video ever made. Ever. In the history of ever. Ever." Now, the clip has hit the web. It's a lyric video for his song "Almost Home" from this year's Innocents. He noted that "the video cost, roughly, $0." 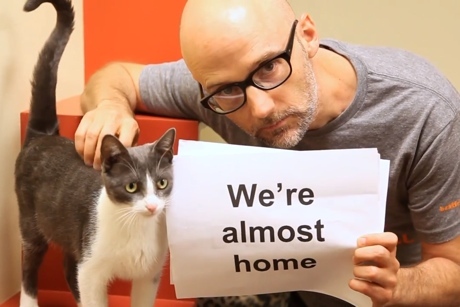 It shows Moby holding up lyric sheets for cinematic ballad while cuddling with some dogs and cats from Los Angeles' Best Friends Animal Society. In the description, Moby encouraged watchers to adopt some of these exceedingly cute kitties and pups.